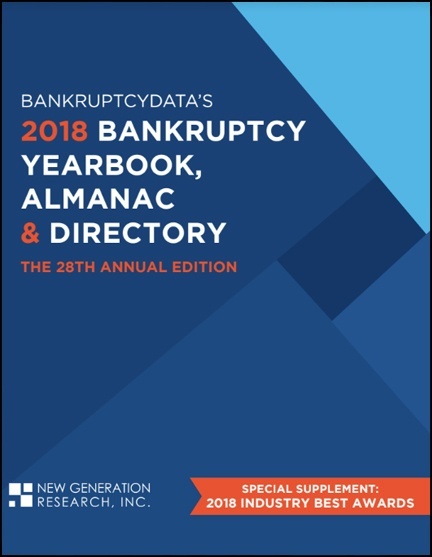 Now in its 28th edition, the Bankruptcy Yearbook, Almanac & Directory is the definitive guide and catalog of record of the most important facts relevant to bankruptcy and restructuring industry practitioners. The Yearbook contains over 500 pages of facts, figures, graphs, research, analysis and commentary. It is incredibly useful for marketing and analysis, finding figures to support presentations, seeing trends in industry, etc. A perfect fit for every legal library. Boston based New Generation Research, Inc. (NGR), is a leading provider of corporate bankruptcy and distressed securities publications, products and services. Founded in 1986 by George Putnam, III, NGR has established itself as the preeminent source for in-depth information on Turnaround investing, corporate bankruptcy data, and distressed companies. Contact us at 617-573-9550 or email us at customersupport@bankruptcydata.com.